Acupuncture and Oriental Medicine have been used to treat allergies for centuries, and studies have confirmed that it can be helpful for allergic conditions including allergic rhinitis, asthma, hives, and food allergies. The Oriental Medicine approach is designed to clear the nasal passages, support the immune system, and balance and strengthen the systems of the body related to the respiratory tract. Common allergens are flower or tree pollens, dust and dust mites, animal dander, grass, weeds, flowers, trees, and molds. Chinese Medicine treatment is focused on relieving the acute symptoms of allergic rhinitis while also treating the root problems and are contributing to the body’s hypersensitivity to allergens. Treatments include acupuncture, Chinese herbal formulas, and dietary modifications. 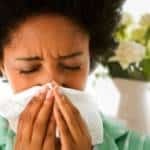 A person experiencing an allergy to anything, whether it is from exposure to something in the environment or whether it is from ingesting a food, is often advised to avoid certain foods, such as dairy, wheat, corn, peanuts, and chocolate. These are common food allergens and can cause inflammation and can place extra stress on the digestive tract and immune system. Nutritional supplementation, such as Vitamin C and Vitamin B5, may also be suggested. There are certain foods which can give the body additional strength to fight allergies. Ginger is considered a natural decongestant and antihistamine. Apples contain the flavonoid, quercetin, which has an a natural antihistamine effect and can decrease inflammation. Quercetin can also be found in berries, red grapes, red onions, capers, and black tea. Carrots contain beta-carotene which can decrease inflammation. Apricots, pumpkin, sweet potato, spinach, kale, butternut squash, and collard greens also contain beta-carotene. Omega 3 can counter the formation of chemicals that cause inflammation of the air passages. Natural sources include flaxseed oil and salmon. Yogurt may be an exception to the elimination of dairy as it can help decrease food sensitivities. Fiber helps decrease food sensitivities as well. Using local honey is advised as it comes from the local flowers and is thought to build the body’s resistance to food sensitivities. With the common American diet of processed foods, foods full of additives and preservatives, beef and chicken raised on antibiotics, fish possibly full of mercury, etc. a gentle detoxification of our bodies, especially the kidneys and liver, is often recommended at least once a year. Many herbal formulas can be found in health food stores that are easy to use. Drinking hot lemon water ( a little local honey can be added ) in the morning half an hour before breakfast is an inexpensive natural detox.